The starter on my 2000 Ford F150 5.4L failed several times to start the engine. Each time I was able to tap the solenoid with a hammer to get the engine started. A starter for this truck costs from $125 to $175. The starter mounted solenoid is available for a mere $27. The solenoid is often the failure point on a starter, due to either a stuck plunger, bad switch or open coil. 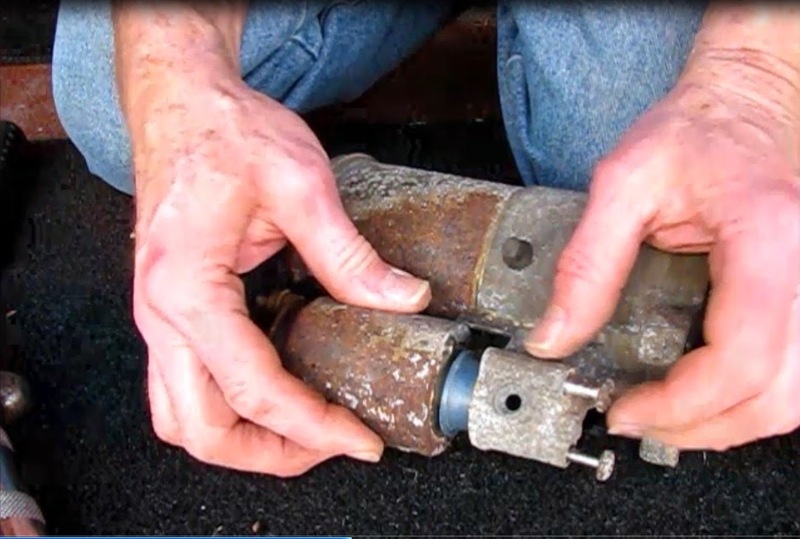 In this post I will test the solenoid and starter out of the vehicle and replace the faulty solenoid. 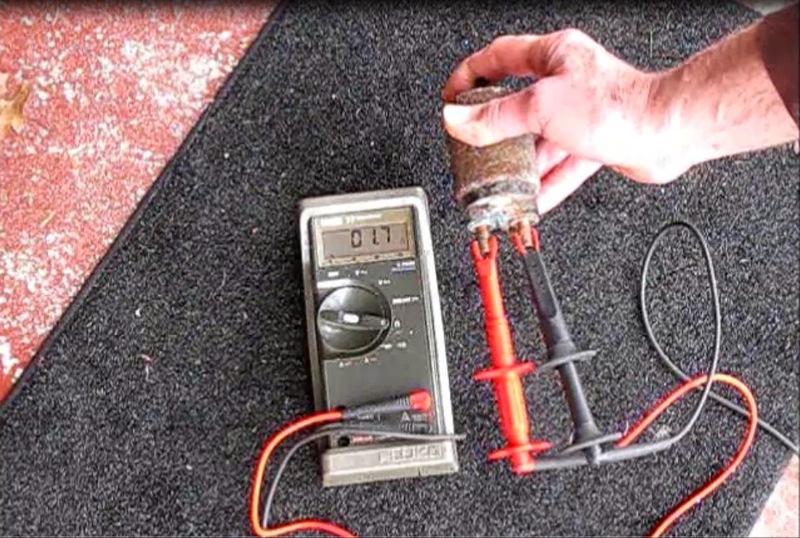 If desired test the starter and solenoid out of the vehicle. With the battery disconnected from the truck, I used a universal battery terminal and attached a 12 gauge wire to it. The other end went through a 10A toggle switch and from there to the small (10mm) terminal on the solenoid. Using a set of jumper cables, I attached one end to the ground terminal on the battery and the other to the casing on the starter. Flip the switch and the solenoid should energize and the pinion gear move out. Mine was intermittent. Bad solenoid. With power applied (11.85V) the solenoid failed to operate. Bad solenoid. To test the entire starter, connect the positive cable on the jumper cables from the plus terminal on the battery to the larger (13mm) lug on the solenoid. 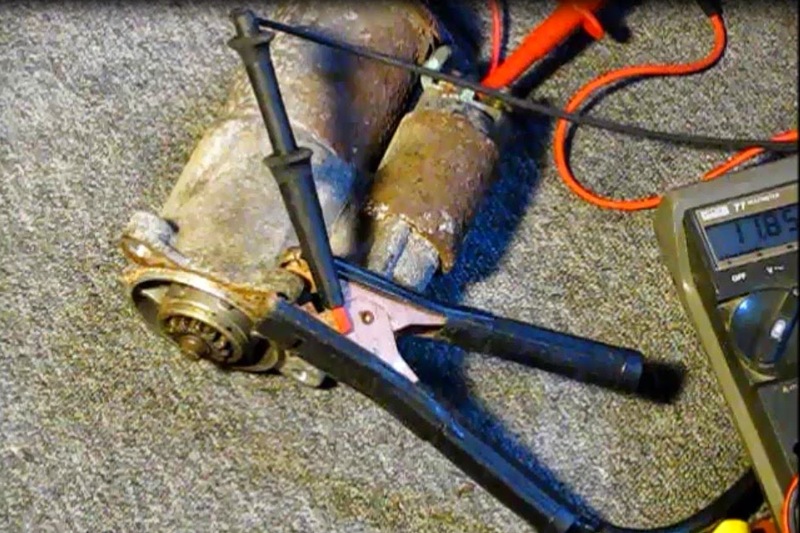 Using jumper cables and a 12 gauge wire, hook up like this to test solenoid and starter. Toggle switch not shown. 1) Unwire the switch lug from the last (13mm) terminal on the solenoid. 2) Using an impact screwdriver or other impact tool break the two Phillips screws loose. Turn them out till they stop. They are retentive screws. 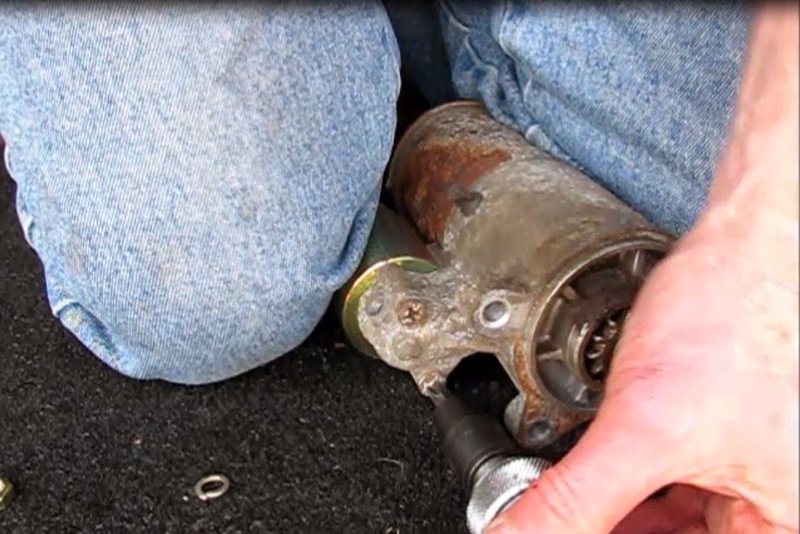 3) Slip the solenoid plunger over the forked end of the pinion actuator and remove. 4) Now the switch in the solenoid can be tested with an ohm meter. Put the meter leads (in resistance mode) on the two large terminals on the solenoid. An open circuit will be measured now. Now manually push the plunger all the way in. At the extreme end of travel the meter will read less than an ohm. This is where the 12V (B+) from the battery will energize the starter windings. 1) Pull the pinion gear outward by hand and engage the disk end of the plunger with the fork of the pinion actuator. 2) Rotate the solenoid until the correct hole lines up with a screw. Make sure it is oriented so that the switch wiring fitting will fit over the 13mm switch lug on the solenoid. 3) Tighten the 13mm nut back on the switch terminal. 3) Turn in the solenoid mounting Phillips screws by hand and then give each a couple of good taps with the impact driver. Remount the starter on the truck and test. The tutorial is superb.For most it is inevitable. It’s overcoming these obstacles that matters most. So helpful info. I have facing this problem. This offers tremendous flexibility for study of a haul for the skilled. Finally, you get what you get hold of. These meters area unit well well worth the worth. you may not regret the acquisition of a Fluke digital multimeter Multimeter symbols. Thank you for these changes! I am a student, and I understand that this segment of the population needs to be protected and it needs support. By the way, if students need help writing an essay, then you can order an essay EssayReviewExpert.combecause only experienced authors who are competent in various themes work there.